Enhanced Abilities: Venom’s strength, endurance, reflexes and durability are all enhanced by the alien symbiote. Invulnerability: Venom has degree of invulnerability to physical and energy attacks. Wall-Crawling: Venom can adhere to vertical and upside down surfaces. Webbing: Venom can fire parts of the symbiote like webbing from his wrists. 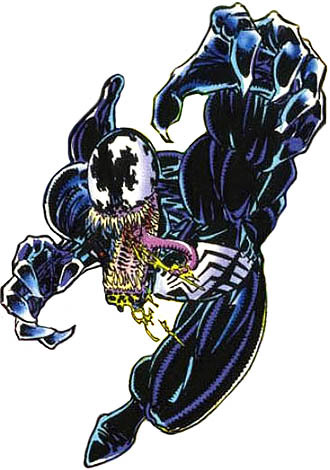 Venom uses the webbing to make swing lines, ensnare opponents and fashion shields. Healing Factor: Venom is capable of healing injuries at a faster rate than normal human healing allows. Immunity - Spider Sense: Venom is completely immune to Spider-Man’s danger sense. He never triggers the sense when he fights Spider-Man. Blending: The symbiote can change it’s appearance to mimic any other garment. Teeth: Venom has a set of teeth which he can use as an offensive weapon. As a child, Edward Allan Charles Brock was raised in a Roman Catholic household in San Francisco. His father was cold and unloving towards his son because he blamed him for his wife's death during childbirth. Eddie constantly attempted to obtain his father's approval, though even after excelling in school, he only received half-hearted encouragements. Though exceptional in athletics, Brock switched his major in college to journalism after reading an article on the Watergate scandal. Upon graduating, he moved to New York City and obtained a job at the Daily Globe. He proved himself to be highly talented, though even this did not get his father's approval. He eventually married Anne Weying, who was attracted by his wit and gentility. Eddie had been a successful columnist for the newly revived Daily Globe until he began writing a series of articles about the "Sin-Eater murders". A bogus offender had confessed to Brock about committing the murders. While protecting the "murderer’s" identity under the First Amendment, Brock wrote a series of stories in the Globe detailing his dialogue with the supposed killer, until mounting pressure from the authorities forced him to write an exclusive revealing the murderer's name. Although that edition of the paper sold out immediately, Spider-Man soon revealed the true identity of the Sin-Eater to be Detective Stan Carter, making Brock a laughingstock among his fellow journalists. Fired from the Daily Globe, he was forced to write venomous drivel for scandal newspapers. Brock blamed his predicament on Spider-Man. Soon after, Brock began an intense physical workout program hoping to reduce the stress his life had become. However, such physical exertions only increased his violent obsession with Spider-Man. Although his body had been honed to near-perfection, Brock’s mind was reduced to an all-consuming vessel of hatred, causing his wife Anne to divorce him. At this time Spider-Man had gained an alien costume during the Beyonder’s Secret Wars. Upon learning that the costume was really a living alien symbiote, a parasite trying to graft itself permanently to him, he used the bells of Our Lady of Saints Church to separate the alien from his body. With both his professional and personal life shattered, Brock contemplated suicide and went to Our Lady of Saints Church where he prayed to God for forgiveness, unaware that the symbiote Spider-Man had discarded was waiting for him. It was this fierce emotion that attracted the empathic parasite. In order to survive, the alien costume had to feed off the nearest and greatest source of emotion. The symbiote joined mentally and physically with Brock, whose emotions overwhelmed the already confused alien. The dominant thought on both their minds was that of Spider-Man. But Brock’s sheer hatred for the crime fighter twisted the symbiote’s feelings to a similar extent. In effect, Brock’s emotions drove the symbiote insane, just as their bonding may have driven Brock over the edge. Brock soon discovered that the costume gave him all the powers of Spider-Man, and more. It also added bulk to his already large frame and increased his strength to superhuman levels. Calling himself "Venom," Brock directed the costume to sprout a hideous grin and plotted his revenge.